Welcome to the Information Centre! The Information Centre is designed to provide answers to frequently asked questions. Please do not hesitate to contact the school with any further questions and queries. Information in the Centre will be frequently updated to provide current copies of newsletters and policies. 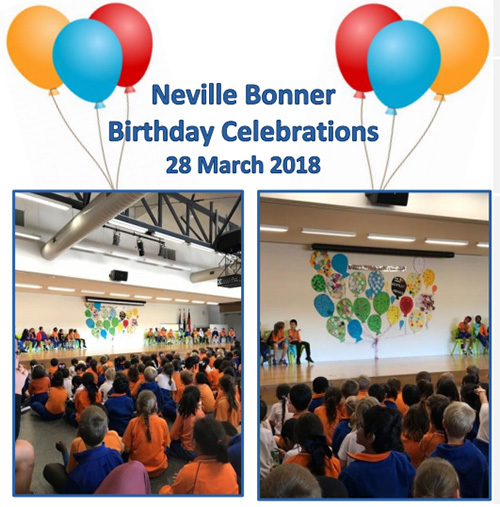 At Neville Bonner Primary School, we take pride in our community’s focus on Kindness and Respectful Relationships, and the work our families, children and staff all do to ensure a safe and supportive learning environment. Friday March 15 is the National Day of Action Against Violence, an initiative that aims to address ways we can support our community in continuing to build our range of skills and strategies for safe and respectful interactions. Over the next few weeks, the children at Neville Bonner will be involved in conversations and activities that explore this thinking. Mindfulness, and peer support will be included in this, and we invite families to continue these conversations at home using the resources the children will bring with them. We also hope you can join us at some of the exciting community initiatives that will be happening at school. We look forward to making a stand with our community and affirming our commitment to integrity, mindfulness, kindness, and Respectful Relationships. 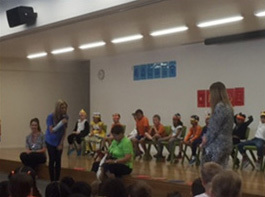 The children in Years 3-6 were very lucky to have the Questacon Science Circus visit our school to polish their presentation skills before they set off on a tour around Australia. Topics covered in the various shows included flight, sound, collisions, structures, bubbles and fluids. Thank you everyone for a fantastic Swimming Carnival last week! The children had a great time participating in the land and water activities. A big congratulations to all the children who participated in the swimming races- what a fantastic effort! Ribbons for these races will be presented in Week 8 at the Whole School Assembly. Thank you to all those who attended the Information Evening on Tuesday this week! Our new format provided greater opportunities for parents/carers to interact with staff and seek information about learning that was relevant to their interests. We received very positive comments from families about the style of the evening! Help our worms and help our Earth! 100kg of organic waste needed every week! We invite you to add your own organic waste to the school worm farm. 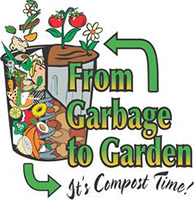 Simply bring food scraps to the bins at the end of the worm farm. We will do the rest. We only ask that NO meat is added to the organic matter. Worms are strictly vegetarian. Because our worm farm is so big it can tolerate citrus and potato peels. You will be amazed at how much you can recycle and our worms will thank you! What an honour is was to judge such extraordinary speeches at our Public Speaking School Final Competition, Rostrum. Thank you to the children who braved the stage to share with us their ideas and words – and thank you to the teachers and adults who supported the children in participating. A big congratulations to Sohil from the Year 6/5, who was our winner on the day. Sohil impressed the judges with his audience engagement and use of humour. Sohil will represent Neville Bonner Primary School at the next round of finals. What a fantastic day we had on Saturday at the Markets and Book Fair! 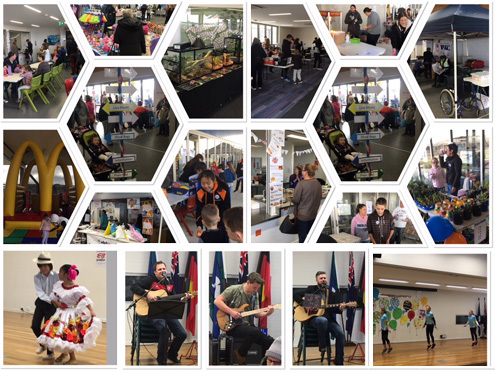 A large number of families and residents came along throughout the day – it was a happy community atmosphere with music, dance, yummy food, carnival activities and lots of chatter and laughs! How do we begin to thank our amazing P&C, led by the inimitable Kylie? Her attention to detail and seamless organisation in conjunction with her leadership of such a dedicated and ingenious team ensured a wonderful event for us all. 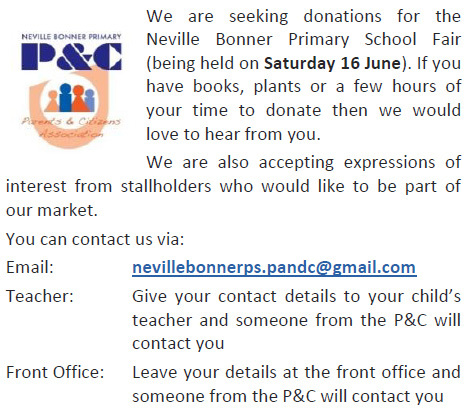 On behalf of our community, we thank the P&C and the many volunteers who gave so selflessly of their time - we were all so proud of Neville Bonner Primary! Thank you to all the parents and carers who braved the cold last to attend the mathematics workshop run by leading mathematics expert Anita Chin. I know you would all agree that it was worth it! Anita was highly engaging as she explained the way Mathematics is taught to children today and how it is different from how we were taught when we were at school. The adults were the students for the evening with the opportunity to experience it firsthand! It was amazing to see how many mathematicians we had in the room- no wonder we have so many clever children! There were a lot of laughs throughout the evening with parents and carers sharing positive feedback and their appreciation for their new understandings of what goes on in the classroom today. A big thank you to Anita for hosting the evening! On Thursday the 20th July we hosted our ‘Immersion Visit’. 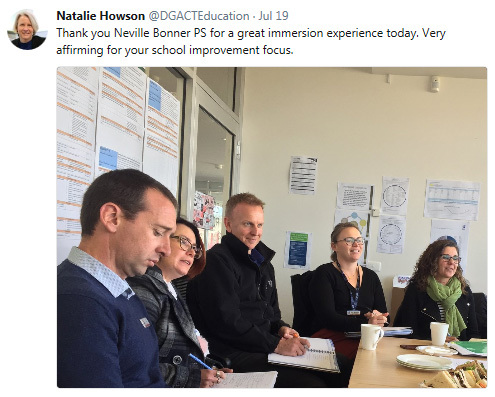 A group of Principals, Deputy Principals and Directors visited our school, spending half a day observing the children’s learning and sharing in reflections on our school’s growth as a place of learning. Our focus for the visit was learning in mathematics and the utilisation of our built environment to optimise learning opportunities. We were delighted that Natalie Howson, our Director General was able to join our ‘Immersion Visit’. Our guests were impressed with the children’s engagement in learning and the deep investment of all of our staff in improving outcomes for all our children. The above image was posted by our Director General, Natalie Howson on her Twitter Feed after the ‘Immersion Visit’. 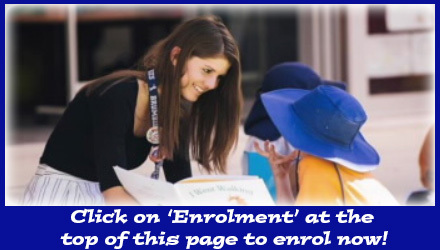 Neville Bonner Primary School 2018 Enrolments Now Open! Today we were delighted to welcome the Chief Minister, Mr Andrew Barr, Education Minister, Ms Yvette Berry and the Director General Education Directorate, Ms Natalie Howson to our school. Their visit to our school coincides with the anniversary of one hundred days of Government since the last ACT election. Chief Minister Barr, Minister Berry and Ms Howson visited the newly re-furbished preschool facilities and our new buildings at the far end of the school. Pari and Ashish from Year 6 led our visitors on a tour and described the outstanding new facilities for our children. Our visitors shared a deep interest in our school and community, asking the children many questions! In place of this performance, there will be another Matinee on TUESDAY 13 DECEMBER AT 9.30 am. We apologise that we are unable to schedule an alternative evening performance. We realise this will be disappointing for families. We thank you for your understanding. On Friday the 25th of November K-Mart Gungahlin launched their first ‘Christmas Wishing Tree Appeal’. A group of 20 students from year one were asked to represent Neville Bonner Primary to help kick off the event. We sang a song for the crowd, decorated the tree, and were honoured to make the first donations to the cause. There was also a surprise visit from Santa and some of his friends. We were very proud of the children and the way they represented our school at this special occasion. At Neville Bonner Primary School we really value and appreciate all the hard work our volunteers do for us. We would like to invite you to a ‘Volunteer Morning Tea’ on Wednesday, 7th December at 10:30am, straight after our morning Assembly. Please let our Reception staff know, by Tuesday 6th December, if you would like to attend. P & C - Book Club! Thank you to all the families who supported the book club in 2016. With the generous support of the school community, the Parents and Citizen's Association were able to donate over $1500 worth of resources to the school library. At each of our Assemblies this week, we were treated to a surprise visit from a four legged client of the RSPCA! Our Student Council, organised a fund raising day for the RSPCA, and we were all rewarded by the presence of our special canine visitor. Thank you to the Student Council for organising such a special event for all of us. The Student Council would like to thank our generous community for their support with our One Walk event. Our school raised $711.90 from your kind donations! This money will go straight to help finding a cure for Type One Diabetes. 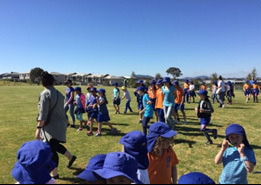 The children, teachers, staff and community members had a fabulous time walking in the sunshine. Did you know there are over 400 different types of worms? Composting worms are specific species of the earth worm family. Our worm farm hosts three types Tiger, Red Wrigglers and Indian Blues. Each week our worms consume 100kg of organic waste. That’s a lot of rubbish! The result of this hard work is a byproduct called castings. Lovely, rich fertiliser. The worms have produced approximately 1 ton of compost over the past year and it’s now time to move it to the garden. Next Tuesday 22nd of November we will move the worms to a new home and the castings to the garden. This is a significant milestone, as a community we have made some very green footsteps. Families and friends are invited to participate next Tuesday. Bring your wheelbarrow and shovel if you like getting in amongst it, we have a lot of dirt and castings to move, even 30 minutes of your time would make a difference. Alternatively if you would like to watch the moving of the worms feel free to drop by during the day 9am-3pm. We have GONE GREEN, help us celebrate. 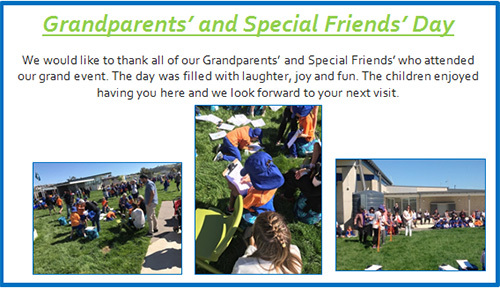 On Monday and Thursday the children were very excited to welcome their grandparents and special friends to Neville Bonner Primary School. The children showed them what a typical classroom looks like in 2016. 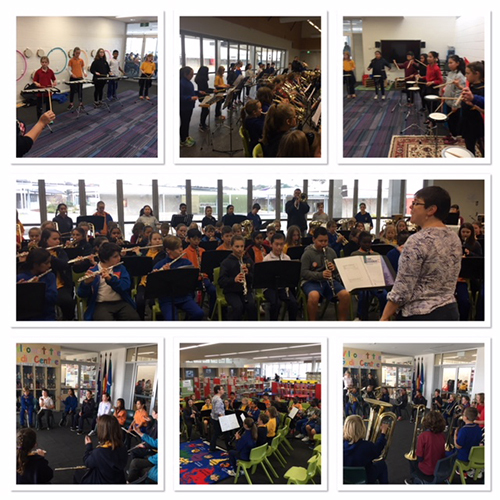 The Music Enrichment group and the Year 6 Band performed for the grandparents and special friends on Monday. We would like to thank all our visitors for helping the children enjoy their morning activities. Every day, teachers and those who work in schools are making a difference educating and inspiring young people across our country. World Teachers' Day is an opportunity to acknowledge our teachers and school staff and say thanks for the significant contributions they make in our classrooms and communities. Celebrated in more than 100 countries world-wide, World Teachers' Day was established by the United Nations Educational, Scientific and Cultural Organisation (UNESCO) in 1994 to recognise the role of teachers in society. World Teachers' Day is held internationally on 5 October. As the day usually falls during school holidays, Australia celebrates on the last Friday of October each year. 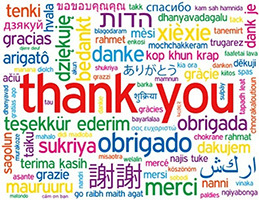 Get involved – say thank you to teachers and school staff!